A C4ISR System Designed for Scale – AGIS, Inc. Built into the design of LifeRing is the capability to scale up or down. The latest beneficiaries of this feature is a NATO Partnership for Peace Country Joint Level Command and Control facility which is designed to accommodate ground, air and sea forces. 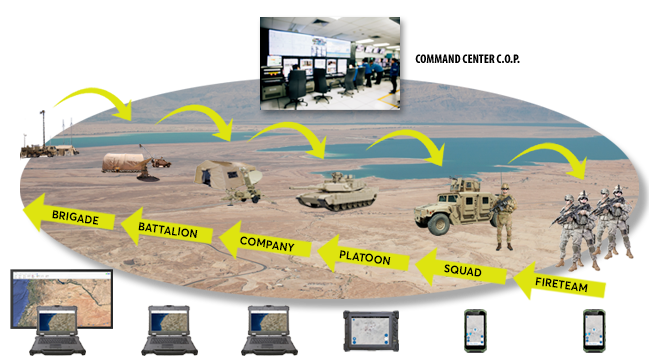 The Strategic Level LifeRing software allows users to easily expand to incorporate the subordinate level Brigade, Battalion and Company-level systems, thus enabling critical C4ISR data to seamlessly flow up and down the Chain of Command, allowing views of a Common Operational Picture and using digital communication devices to Coordinate, Collaborate and Command between the various military command levels. Built into the this advanced capability securely provides LifeRing users a fully integrated Command and Control capability with little additional hardware investment because this C4ISR encrypted system enables standard computers and Smartphones to be connected to military radios, satellite and commercial forms of communications in any combination.